The last time I saw a shark movie in the cinema was probably Shark Night back in 2011. I’m gonna go on record and say I shouldn’t have wait five years between stupid shark movies. Hear that, Hollywood? Get to work. This time around it’s Jaume Collet-Serra’s turn, director of the average House of Wax, the fantastic Orphan and three Liam Neeson thrillers (soon to be four.) Say what you will about this guy’s output, but at least the movies look nice. 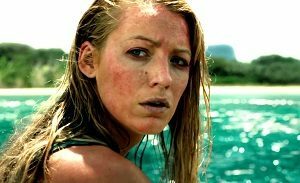 Sure, a film like this, with its summery, beach setting, has a tendency to look like a tourism and/or Coke commercial, what with Blake Lively’s bikinied bod front and centre, but you can’t deny that Collet-Serra makes good-looking movies. Lively is a great actress and more than holds her own here. This is the type of gig most actors would kill for: Lively’s character Nancy is on screen for every scene bar one, and for the most part she’s on her own. Except for a seagull. Kudos to Sully “Steven” Seagull for a brilliant supporting turn (or is that ‘tern’?) Nancy finds herself stuck on a coral outcropping with a giant vindictive shark circling her. When the tide comes in, her sanctuary will vanish. I really dig this kind of movie. Single character, single location – just sit back and let the writer come up with each event one by one. It’s a good example of writing via problem solving. And it always gets my attention. The film gets progressively sillier and sillier – we’re not quite in Shark Night territory, but neither are we close to the pseudo-realism of The Reef – and safe to say that by the time the climax rolls around, there’s no point worrying about realism. Jaws set the standard all those years ago anyway, by asking what happens when a great white becomes territorial…everything that’s followed in its wake has simply stolen from Spielberg’s masterpiece of tension. Unsurprisingly, the camera gets a little male-gazey, particularly in the opening half hour. At least it is vaguely contextual, since Nancy’s at the beach. Then again, you’d expect her to be in a full body wetsuit when going surfing, wouldn’t you? I guess we should be thankful for the rashie, when Blue Crush presented us with girls surfing in nothing but bikinis. The sub-par VFX get in the way occasionally. There’s a couple of awkward moments of digital face replacement and some dodgy creature effects that I noticed, but perhaps that’s just the danger of living with a VFX artist. At a lean 86 minutes, The Shallows gets the job done skilfully. There’s nothing new here, but the screenplay is decent, Lively’s character has some depth and the narrative successfully presents her with challenge after challenge. All in all, a fun time at the movies.